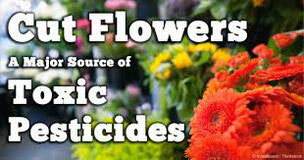 Flowers and Pesticides - a Real Danger? There is probably hardly anyone who goes into a florist shop and buys a bunch of roses for a loved, who wonders how much pesticide contamination is in the flowers he or she will bring home. The cut flower trade has become an important part of many airlines cargo traffic from African and South American countries. But - how safe is it for the workers in these countries and the end consumer? 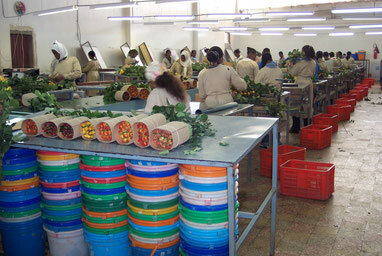 The cut flower business continues to boom, not just on Valentines Day, Easter or Christmas. It has become a major economic saviour for some countries in South America and Africa and a much-needed revenue bringer for the airlines. 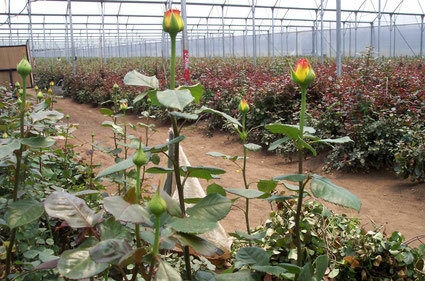 Growers in Africa for example have developed massive flower fields which are cultivating and cutting hundreds of tons of fresh flowers daily. These are usually flown out the same evening on freighter aircraft to Europe for next day distribution to florists. How can you grow flowers and distribute them so fast without parasites affecting them? Massive amounts of pesticides seems to be the answer. A real danger for those working in the fields, handling at the airports, for airline crews who spend 8-10 hours in close proximity and maybe just as well as for you when they are in your living room. Or, are we being too pessimistic? Maybe not, as recent television and media reports indicate. World health experts estimate that there are up to 40,000 chemical related deaths per annum in countries where flowers are cultivated. This, they state, can only be attributed to the massive amounts of pesticides being sprayed daily over the fields. Furthermore, they state that at least a third of all pesticides in use are extremely dangerous for humans. Then, there is the consumer aspect. Does he or she know where the flowers they buy come from and how they were treated? Mostly not. It’s no real secret that the use of pesticides outside of Europe is by no means as regulated as it should be. This, it is said, applies especially to Africa where controls are very lax. For example, the pesticide called Methamidophos is rated as being very dangerous to human health and has been long banned in Europe, but not so in Africa. Tests show that this chemical is being continually found in cut flowers from the region. Health of workers and consumer is not an issue! That’s what it looks like as workers on the flower farms hardly have any protective clothing, are not informed on the dangers they face and often work in a foggy pesticidal cloud of forbidden chemicals. The same would surely apply to all those who handle the flowers at airports, the crews of the aircraft flying them and last, but not least, the end consumer, who, if all being reported is correct, are just as much affected. Do the airlines, exporters and more importantly, the importers want to realize what dangers there are and ensuring that illegal spraying be stopped altogether? It has to be proven first - who’s going to do that? It’s time for the United Nation’s World Health Organization (WHO), the International Trade Union Confederation (ITUC) but also IATA and ICAO, the World Wide Fund of Nature (WWF), Greenpeace, and other globally acting environmental organisations to take coordinated action to stop the poisoning of humans and nature - fast.